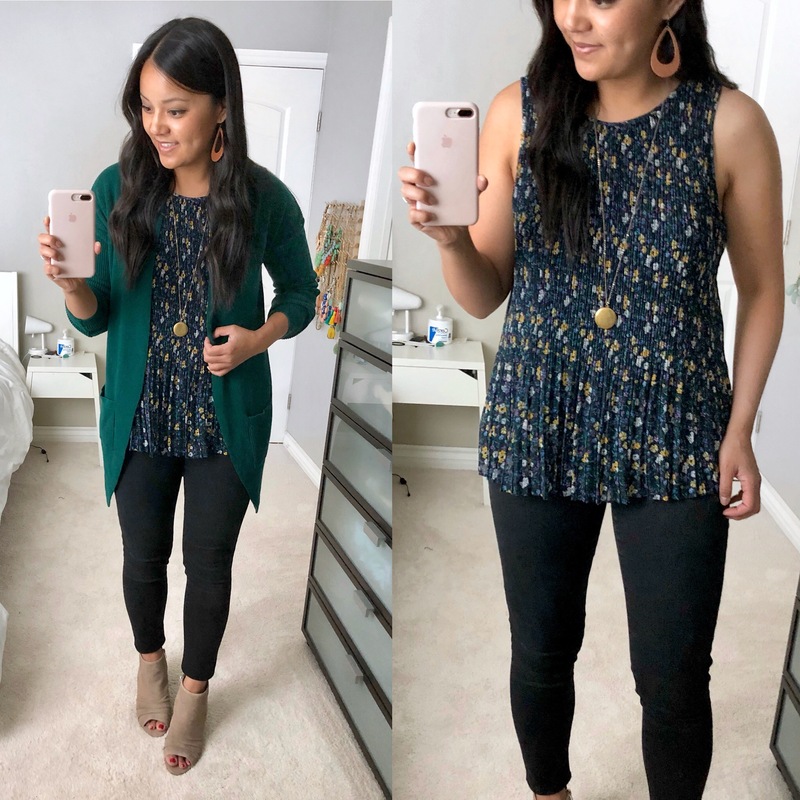 Nordstrom Anniversary Sale Try Ons #2 + GIVEAWAY! Public Access TODAY! NSale Try-Ons #2 + Wit & Wisdom GIVEAWAY x3! Hey everyone! Today begins Public Access for the Nordstrom Anniversary Sale! Anyone can now shop the sale, even if you don’t have a Nordstrom card. I’ve got a second round of try-ons for you! (Catch my Try-Ons #1 HERE.) Plus, we’re giving away a pair of Wit & Wisdom jeans of your choice to THREE winners! YASSSS! If you want an easy way to keep track of ALL my recs, visit the PMT #NSale Shopping Guide. They’re all in one place, and under each item I indicate which try-on post contains pics of me wearing that item. Hope that helps! 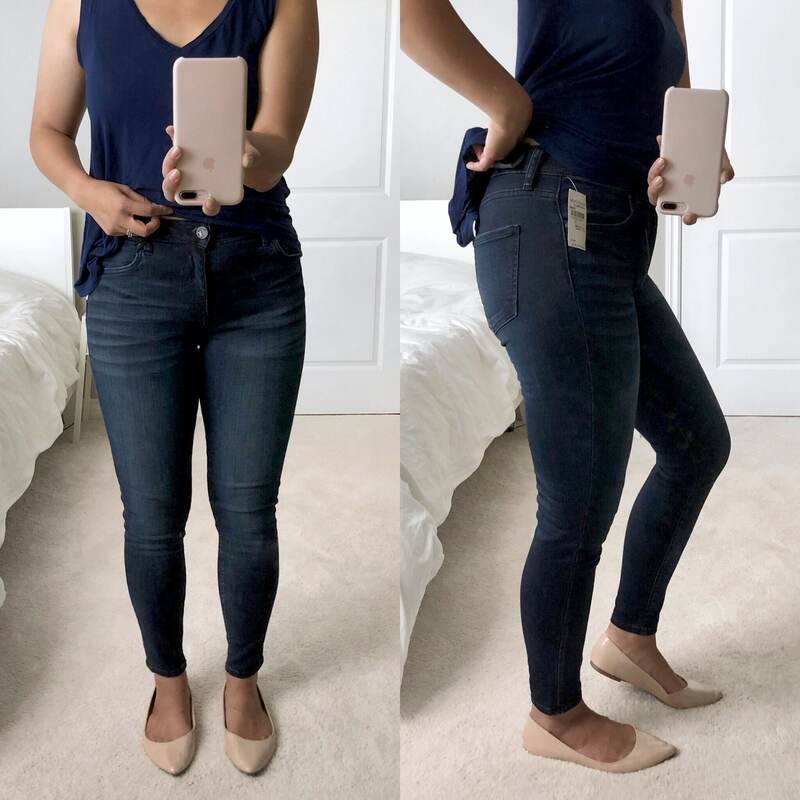 I’ve loved Kut From the Kloth Jeans for a while because they are fairly thick but really stretchy. This pair fits me like a glove at the legs!! The ankle is 1” skinnier than my other jeans, and it’s perfect for me. I wore them around the house for 2 hours to see if they’d stretch out. The knees stretched out a tiny bit, but other than that they pretty much held shape. SIZING: I always heard you needed to size down in them, so in years past I tried size 6. They always looked funny on me. 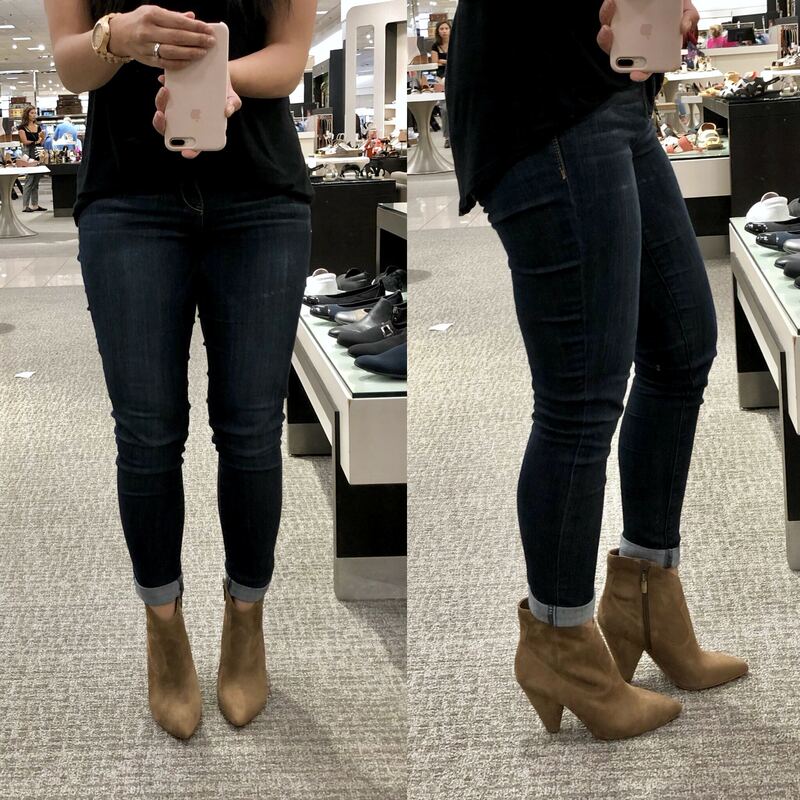 This year I tried size 4 instead, and they fit sooooo much better. Unfortunately for me the rise is 1” higher than what I prefer. When I sit, the waistband cuts into my stomach. 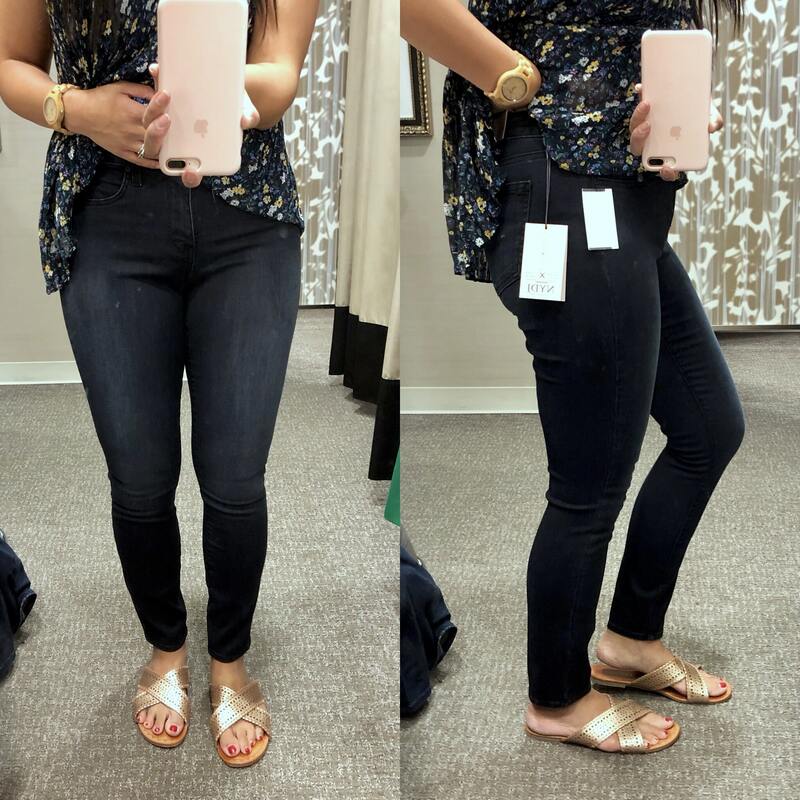 It’s a 10” rise, so if that works for you, try these jeans HERE! Ahhhhh, an elastic panel waistband. Feels like home! If you haven’t heard me talk about Wit & Wisdom’s “Ab-solution” line, basically they’re amazing with an elastic panel at the back of the waistband for extra comfort. They’ve spoiled me and now I want nothing less in my waistbands, haha! OH EM GEE. THIS LIGHT WASH PAIR IS WONDERFUL. 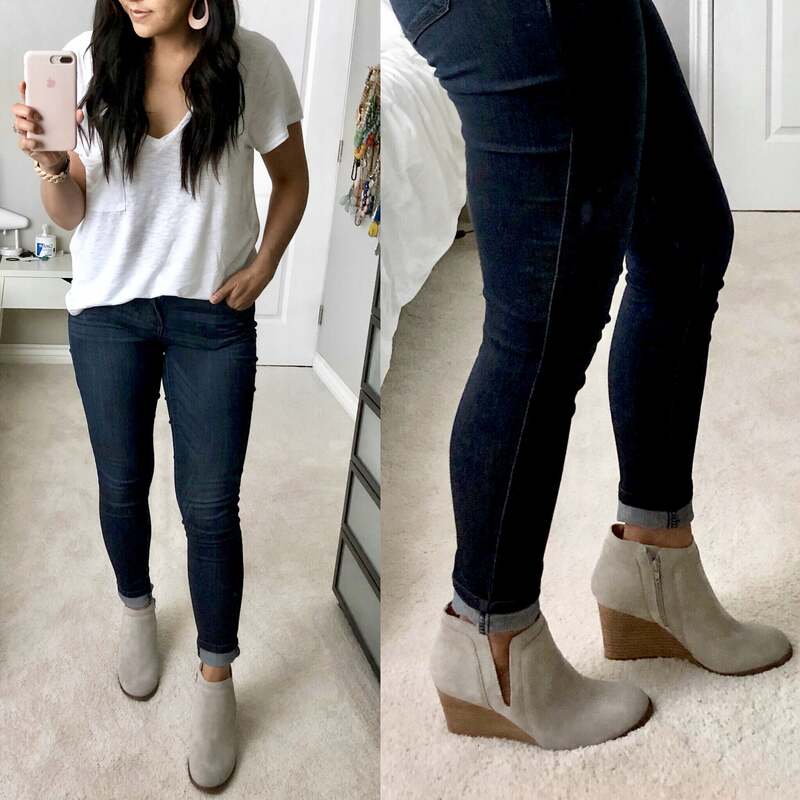 All the different washes feel a little different, and this pair has been the softest I’ve tried of the ankle skinnies. They’re a medium thickness and very soft. I wore them for 2 hours, and they didn’t lose their shape or sag. The longer I wear them, the more they conform to my body, and the better they feel. I previously reviewed this same pair but in the dark wash in my Try-Ons #1 post. With the dark wash, I said I wasn’t sure about the ankle width since I wanted them a little skinnier. 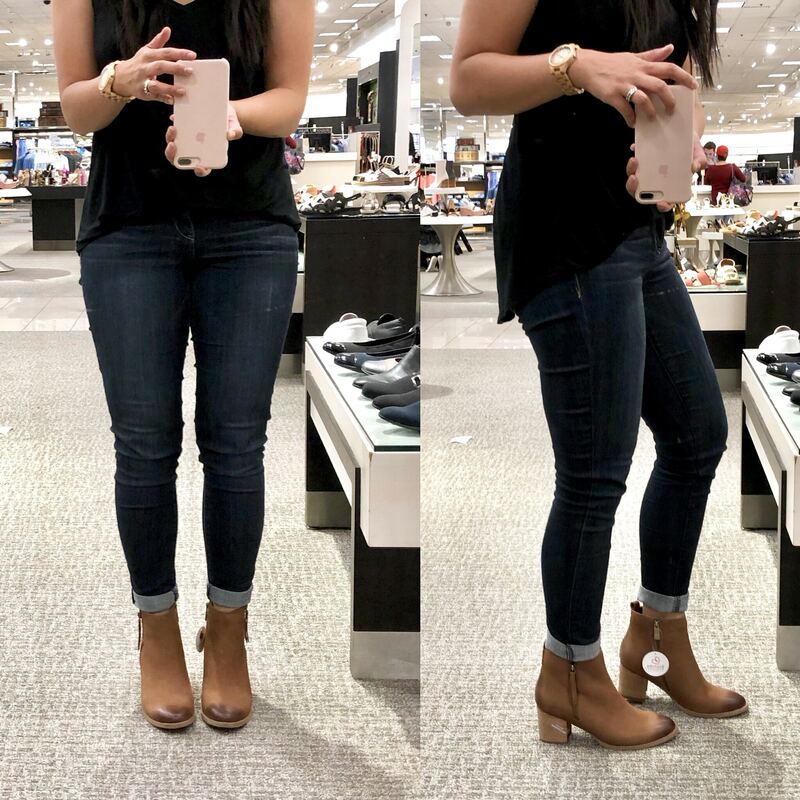 This pair started out the same, but as I wore them longer, the jeans conformed to my body and the ankle got better. I tried it with the dark wash pair and the same thing happened. WOOHOO! 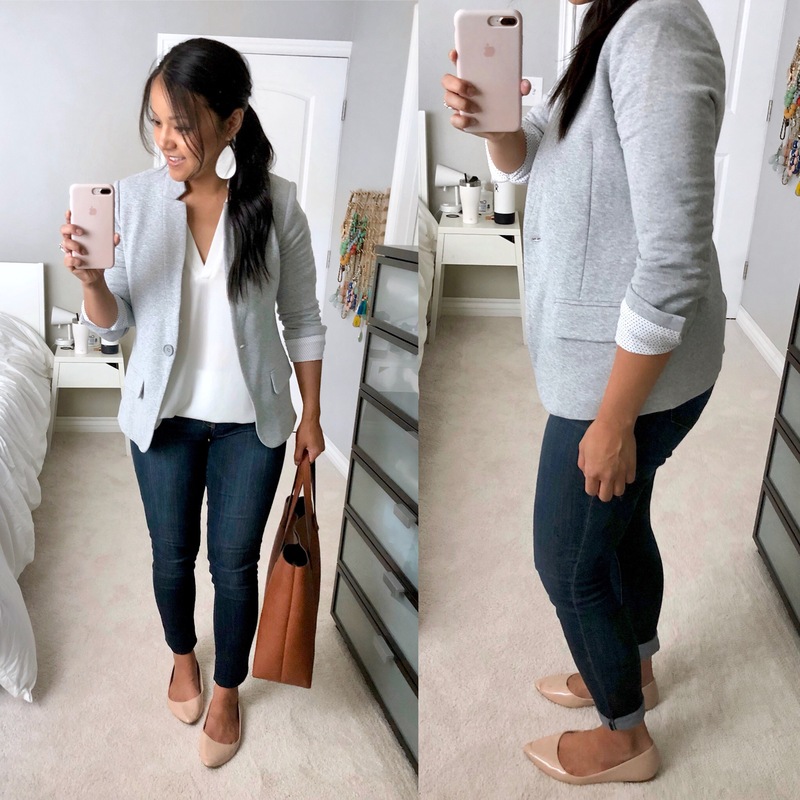 If you’re looking for a light wash denim, this pair is comfy and super affordable on sale HERE! These were soft, thick, and very stretchy. It boasts a “lift and tuck” technology for your tummy and rear. They felt really nice, but there were two things I didn’t love. First, the leg opening was too wide for me. Second, the color is a grayish blue. If you don’t mind, give these a shot because they feel good! Oooookay, how adorable is this sweater? (And those jeans are the Kut From the Kloth ones!) It’s sold out in many colors and sizes, but I’m showing you anyway so you can stalk the site and maybe snag one when returns roll in! This sweater is very stretchy, thick, and soft. Feels like great quality! The scallop details are soooo cute! One caveat: the sweater is somewhat form fitting, and as you can see above it will show lumps. 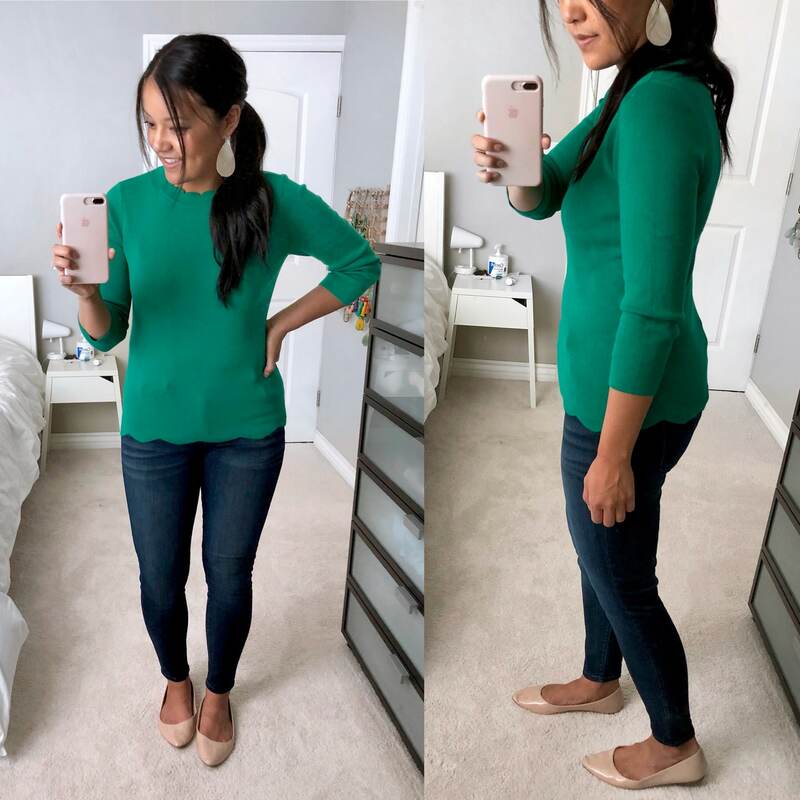 It’d be great with trousers for work, but it also makes for an adorable put together casual outfit with jeans! Comes in 5 colors HERE! This is the same as the red pleated top from Try-Ons #1 that you all went crazy for. It’s the Navy Chintz Floral which is also reallyyyyyy cute! This print is currently stocked in all sizes, including petites. Heads up, while the top is nice and flowy, there’s a lining underneath that’s fitted. 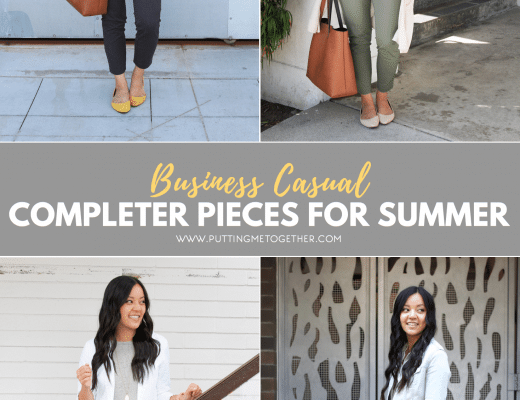 Works well with jeans and a cardigan, or with slacks and a blazer! I love it here with a green cardigan, but it’d also work with mustard yellow, black, white, navy, and maroon. Find it HERE. Pardon the wrinkles—this was straight out of the box. I thought this would be a t-shirt material, but feels more like a reallyyyyyy thin sweater. It’s pretty oversized, as this is XS and there’s still a ton of room. I like this as an elevated but easy alternative to a plain white tee. But it puffed out on me more than I prefer. And it’s kind of thin, so I’m not sure how the quality would be. It’s cute, but for almost $33, I’m not sure it’s worth it. I was surprised how much I liked this. It looks pretty plain, but it’s a very stretchy and soft with a medium thickness! It’s got a little tucking at the neckline, and that small detail makes it more sophisticated than any old tank. It looks polished for business casual with trousers! Other pluses: the neckline is higher, so I wasn’t worried about showing the goods while bending over. The armholes are also high enough so that your bra doesn’t show. This is one of those things that doesn’t look like much online but feels and looks much better in person. Comes in red, black, and heather grey HERE. More expensive than the beloved BP cardigans and the Leith cardigans (both from Try-Ons #1), but for good reason. This is a lot thicker. I couldn’t get a good handle on fit since this was too large for me and I couldn’t try a size down. But if the BP and Leith cardigans aren’t as high of quality as you like, try this one! This coat was interesting–it comes with a removable puffy vest for extra warmth, so you’re getting two pieces in one! 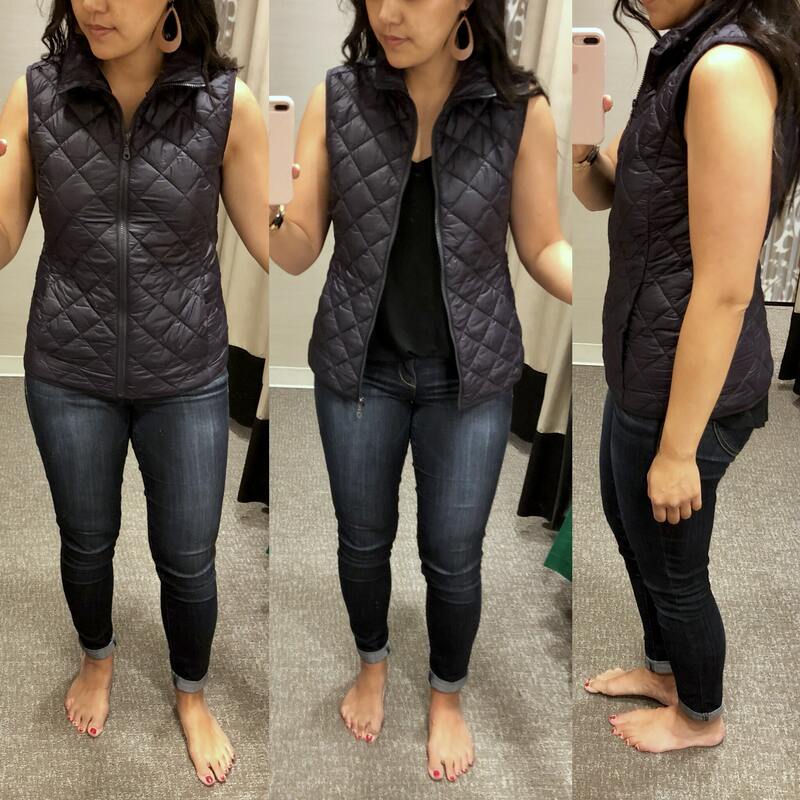 In the first pic, the left is me wearing it with the puffy vest underneath–not flattering. The pic on the right is without the vest. In the second pic you can see the vest by itself. It’s lightweight with a really flattering cut. In the third pic is the trench open without the vest. 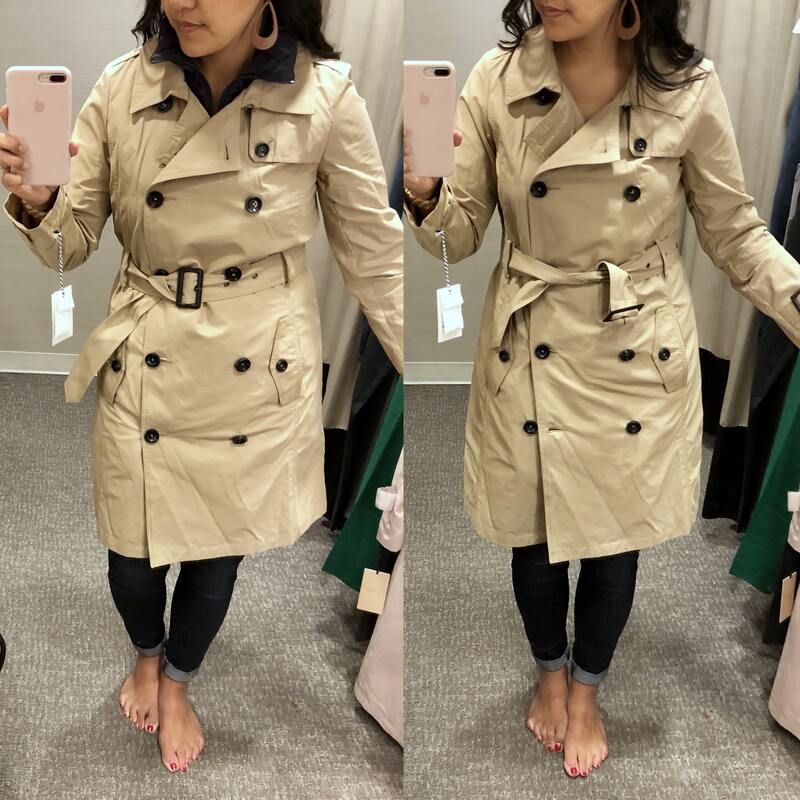 I’d recommend sizing up if you want to try this trench. I’m wearing S but would rather try M. Though I could remove the vest, I think it’d still want it a little looser to accommodate a sweater or thicker shirt underneath. Try the trench HERE. This blazer!!! Feels like a sweatshirt and is still super stretchy even though it’s fully lined. In Try-Ons #1 I reviewed the Caslon knit blazers which cost a lot less. 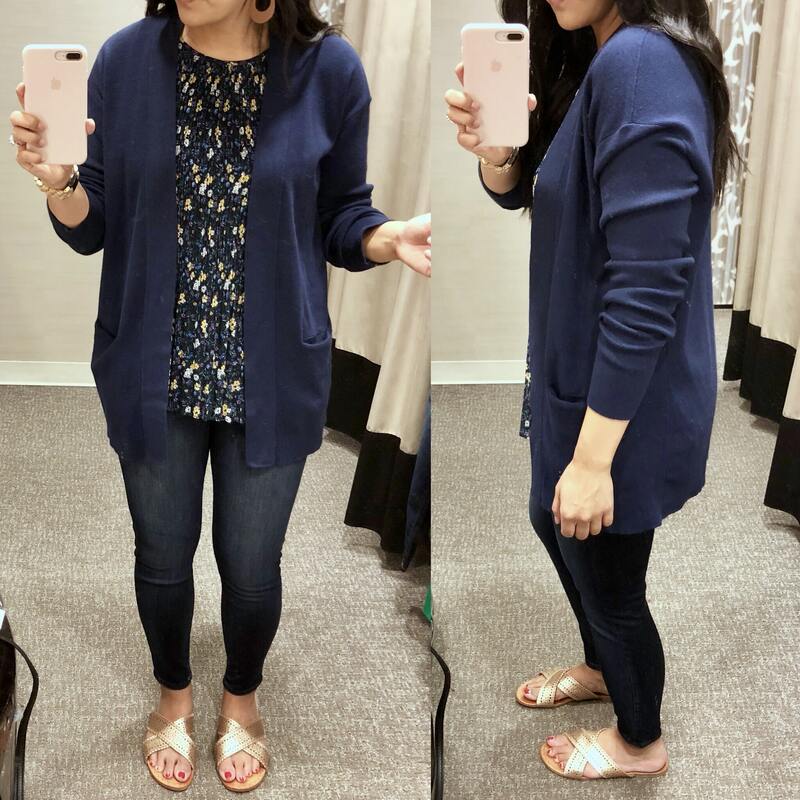 This Olivia Moon one is MUCH thicker and way more structured, while still being stretchy and super comfy. There’s also really flattering seaming, and a cuuuuute polka dot lining! You’re paying for what you get. It comes in 3 colors but unfortunately is sold out in most sizes. I’m sharing it in hopes you can catch someone else’s return cuz this blazer is AWESOME. Stalk this blazer HERE. Last year I was introduced to Blondo, which are supposedly waterproof! My climate is too dry to put them under heavy testing, but last year tons of people from rainy climates said they loved their Blondos. This pair is lightweight and okay in the comfort department, despite the site saying there’s a cushioned footbed. My Blondos from last year are more comfortable. I would put a cushioned insole in these for sure. (Though I do that with most shoes!) But, they are lightweight which is always a plus! They come in 5 colors. If you’re looking for a waterproof option try these HERE. 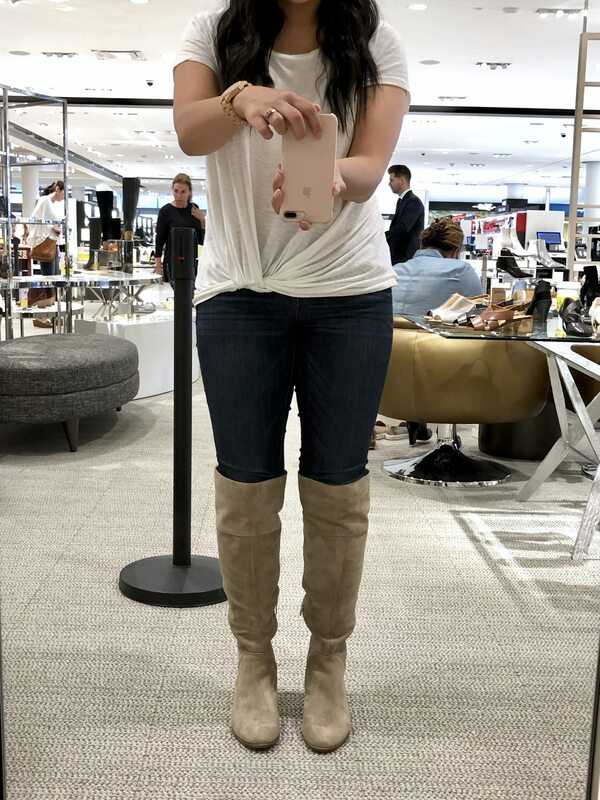 These knee-high boots are really cute! These are lightweight and felt more comfortable than the booties above, but I’d still add a cushion to them. I love the two-toned look which takes away from the harshness that can come with all black boots sometimes. They have a 15″ shaft and 14″ calf circumference. I personally don’t need a pair of tall black boots, but if I did, I’d get these! They come in 4 colors that you can check out HERE. Aw man. 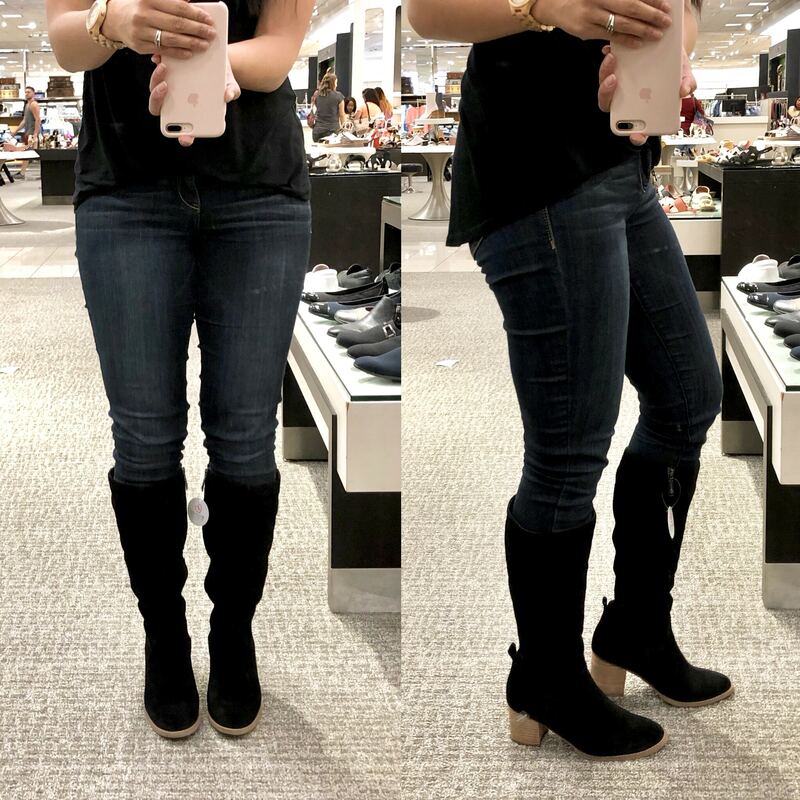 I wanted to love these because boots that have the dip in the front are really flattering. 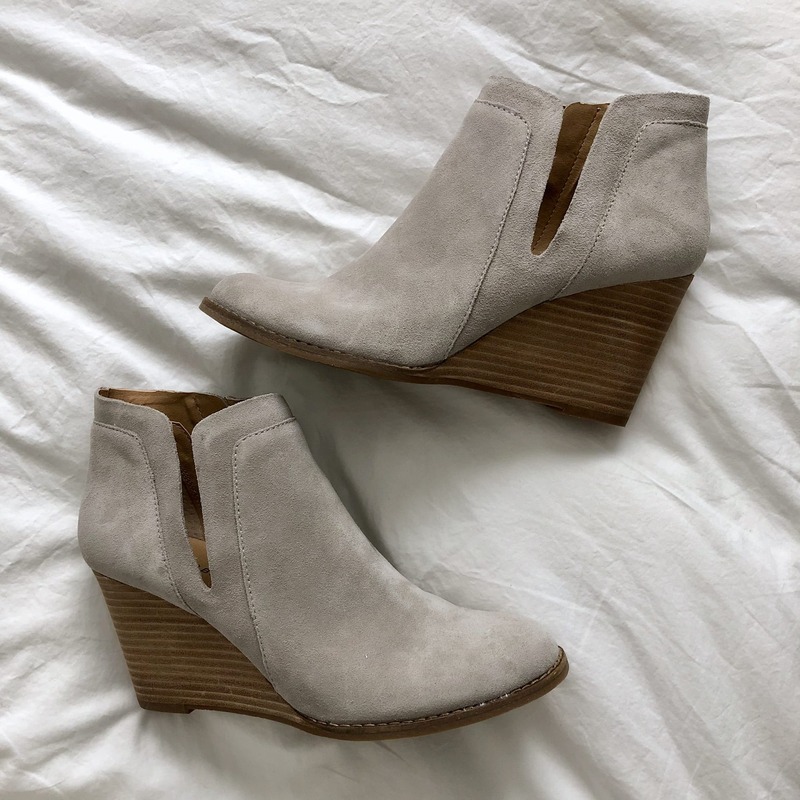 (See my post on Choosing the Right Pair of Ankle Boots.) Long story short, the shaft here is too high overall, and despite the dip, requires you to roll your jeans up a lot which cuts off your leg line. But even still, if you had really long legs where that didn’t matter, these aren’t that comfortable! The upper is nice, but the heel overall feels unstable, and there’s no cushion. Third, from the side they look fine, but from the top they look way too pointy. Pass. The upper is soft and flexible while not feeling flimsy. The footbed felt good too. I *think* this is the taupe color, which looks way more grey in person. This is a good buy at sale price, and it comes in 3 colors HERE! These feel really nice, and the wedge makes them easier on the feet and easier to walk in. The part I don’t love is how round the toe is. Looks cute from the side, but I don’t love how it looks from the front. Might be different in another color. This is Grey Suede, but I’m waiting for Sesame Suede to arrive. Anyway, overall this is a great shoe! See all 5 colors HERE. P.S. 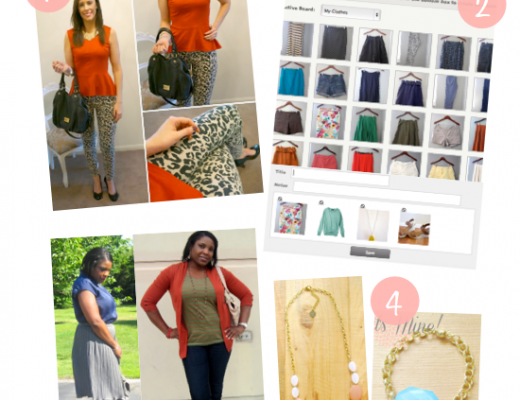 Did you know there’s an easy way to keep track of EVERYTHING I’ve tried from the NSale? 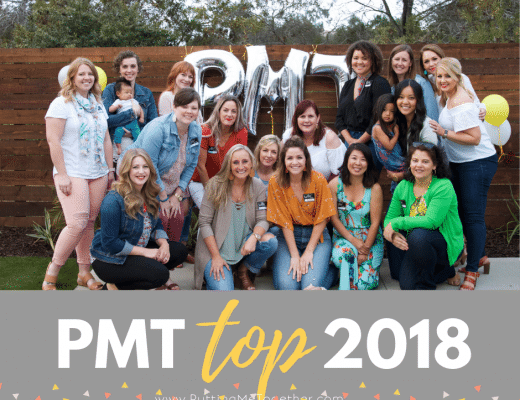 Check out the PMT NSale Shopping Guide! It includes Men’s, Beauty, and Home picks too! 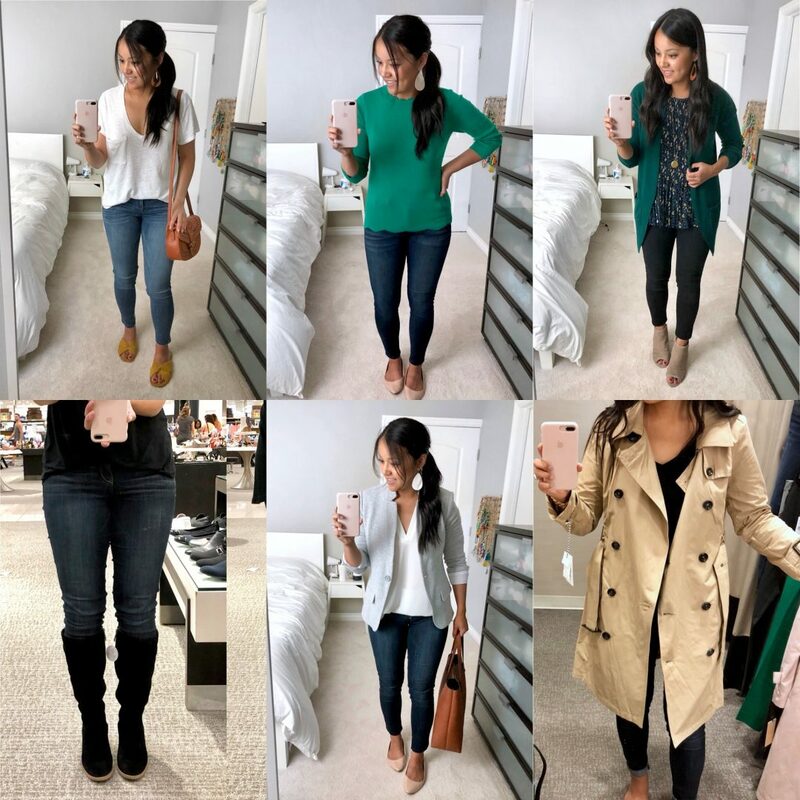 GIVEAWAY: A PAIR OF WIT & WISDOM JEANS OF YOUR CHOICE FROM THE NSALE x3 !! As promised, I’m running a giveaway in nearly every post over the next few weeks! 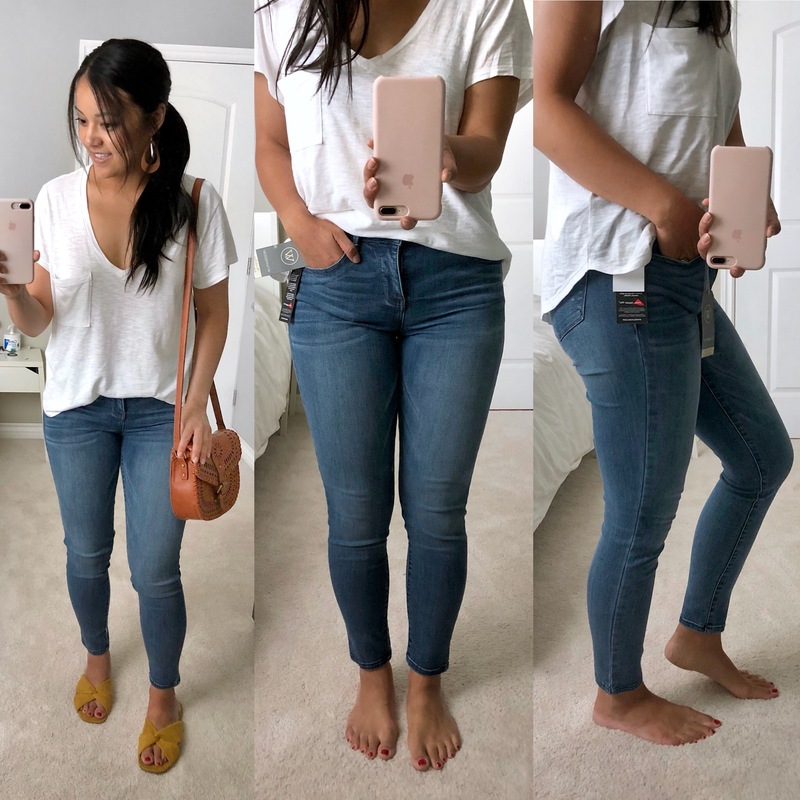 Today, we’re giving away 3 pairs of Wit & Wisdom jeans (included in the sale)– and you know how much I love my WW Jeans! Fill out the Rafflecopter below to enter! The PMT NSale Shopping Guide – Public Access Begins Tomorrow! I’m 8 weeks pregnant and ripped my one pair of jeans that fit me. I’m not showing yet at all and I have no idea what to buy. Do you think the Wit & Wisdom ones would be good to have while my belly starts expanding? Congrats!!! And yes absolutely. I wore them partway through the second tri. Might need to do the hairtie trick still depending on how the jeans fit you to start out. Thanks so much for all of your insight, everything I ordered was based on your recommendations! I think the rest of my order will come today – and here you are with other stuff for me to buy. SMH. One word about my Blondo boot experience. I ordered a pair black waterproof booties in the fall of 2016 – wore them less than 10 times. A couple of months ago, the bottom part came totally off the “stacked” heel and revealed the inside of the heel. The “stacked” heel that I “thought” was wood is really a hard plastic. 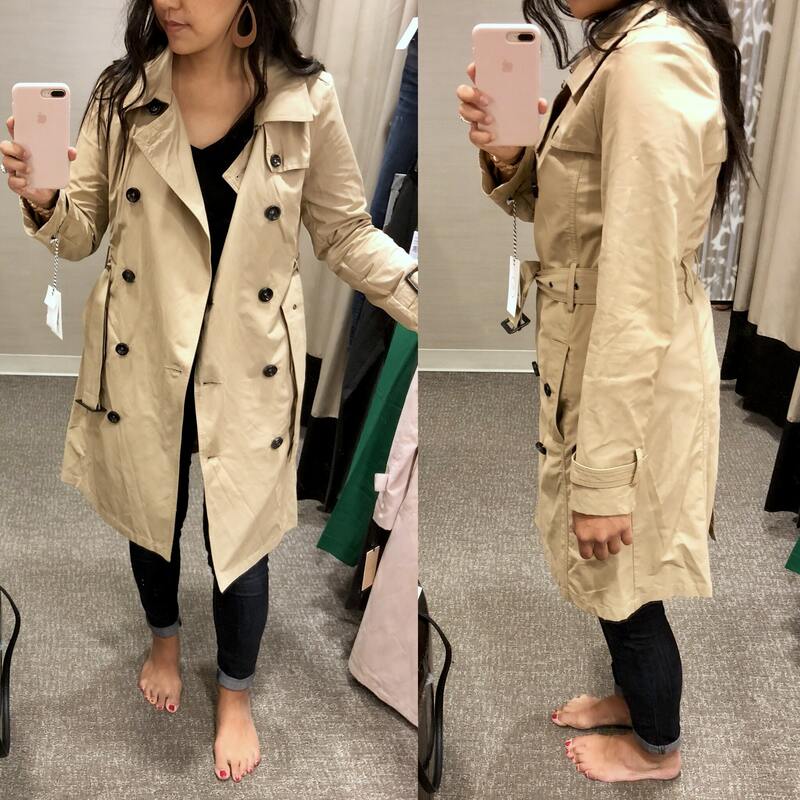 Thankfully, I purchased them at Nordstrom, so I sent them back for a full, no questions-asked refund, but I was really disappointed, as I paid $160 for them and that was too much for THAT to happen. 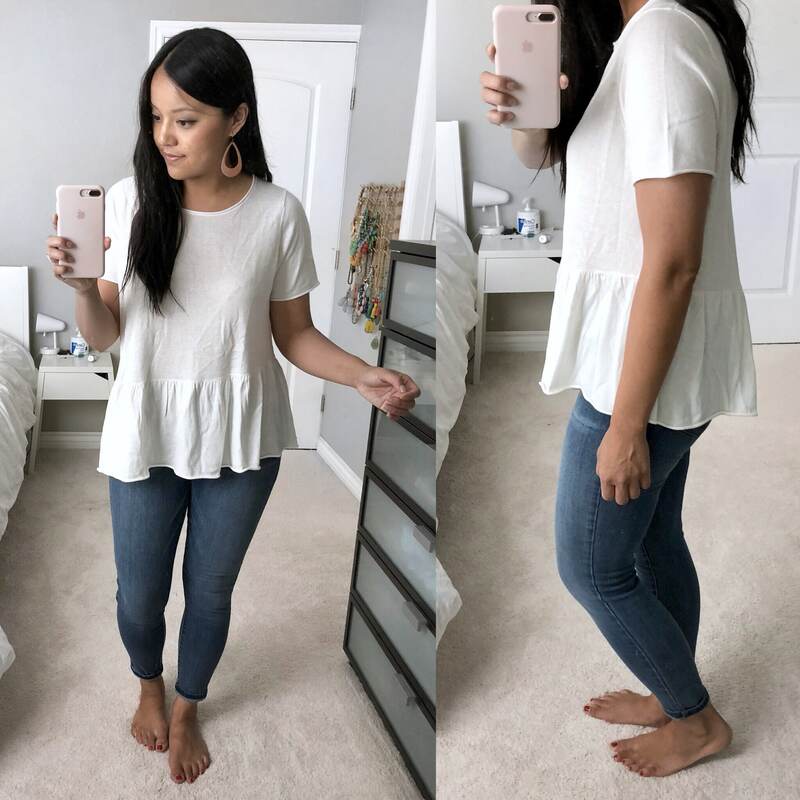 Love all the work you put into your try-on posts! 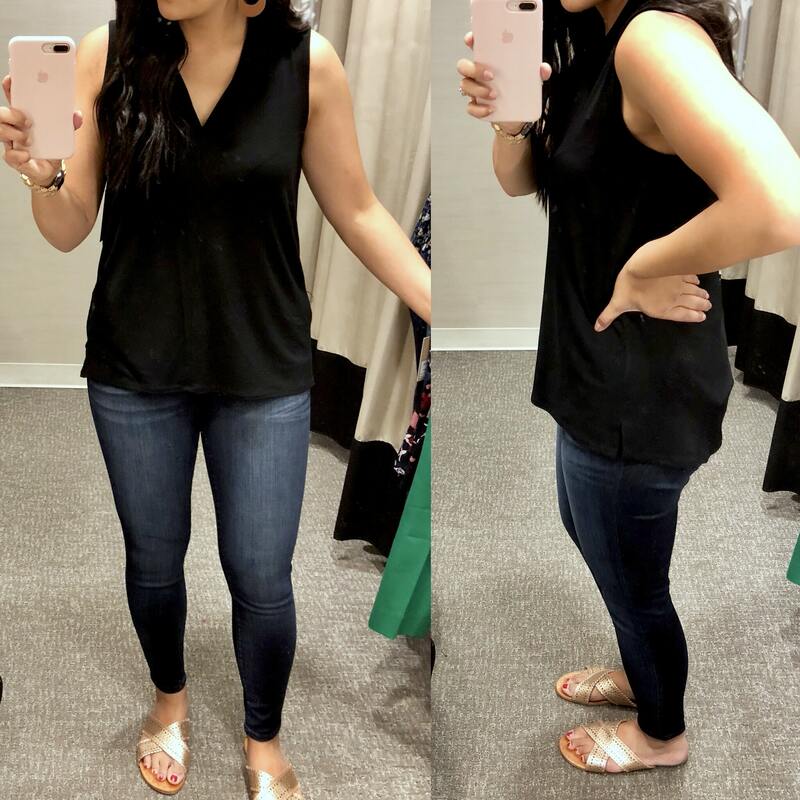 I have a different body type than you, but your descriptions really help me figure out what might work and how to consider the fit of clothing. Plus, taking fitting room pictures?? I mean, that’s uber-dedication right there! 😂 Thanks so much for all you do! Love all the boots, especially the Blondo waterproof ones. So many options to buy. I like the WIT & WISDOM Ab-solution Ankle Skinny Jeans in reg blue! Thank you for all of your reviews! Your sizing info and detailed quality info is THE BEST! 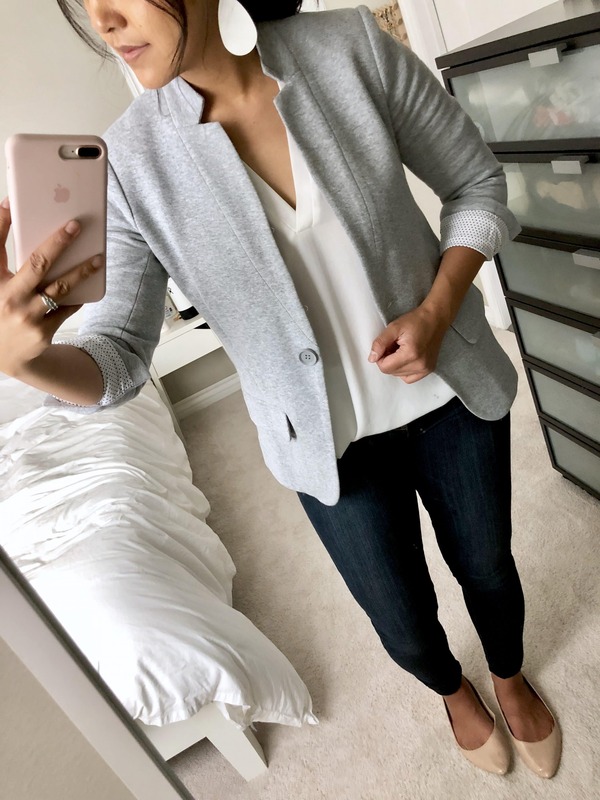 For the Olivia Moon blazer, can you tell me what size you are wearing here? Any sizing tips/details that you feel are important? Hi Jennifer! Sizes for all the items are in the post right under each pic! 🙂 Wearing the blazer In XS. Runs pretty big. If you plan to wear a sweater underneath you may need to size up for the arms. They are stretchy but you never wanna feel like a stuffed sausage haha. Did you by this in a petite by chance? I got the same size but it looks a lot longer on me. I saw there is a 4″ difference in length between the two. Ooh you sold me on the Wit & Wisdom jeans last year, in the black. I had to wait till today to place my order, so I’m trying whatever colors they have left in my size. And also the white – even if it’s not on sale, still such a great price for such a great fit. The whole no sagging thing is HUGE. Glad you got them! The black tends to fade so wash them in vinegar first or whatever that trick is. Did they not restock the Franco Sarto Granite booties? I got those last year on your recommendation (love them!) and was planning on getting black this year.